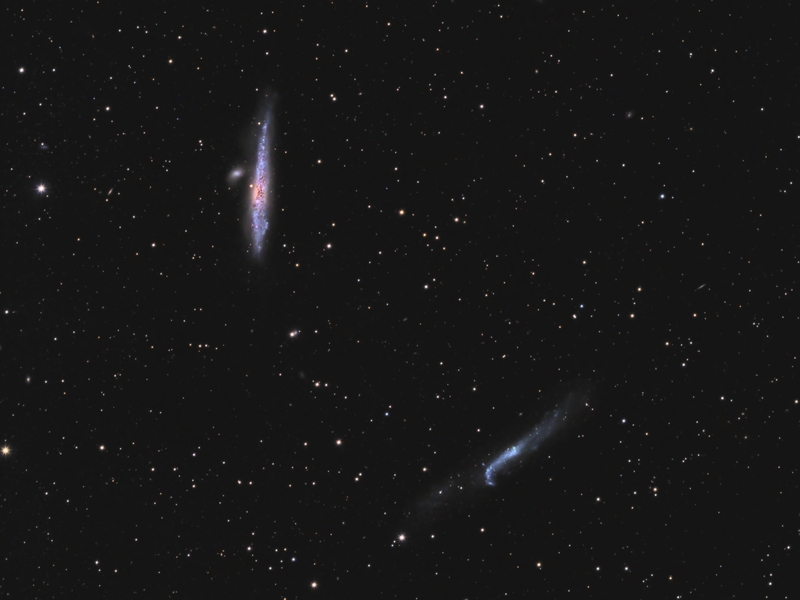 NGC 4631 (top left) and NGC 4656 (bottom right) are known as the Whale Galaxy and Hockey Stick Galaxy, respectively. The Whale is distorted due to its interaction with NGC 4627 just to its left. The Whale shows classic galaxy colours, with a yellow core, blue star clusters and pink nebulae. It is about 25 million light years away. The Hockey Stick, lying about 30 million light years distant, is distorted by a small galaxy just off the tip of the “blade.” In this region of sky there are galaxies everywhere, and you can find many more in this picture. Look for streaks (e.g. 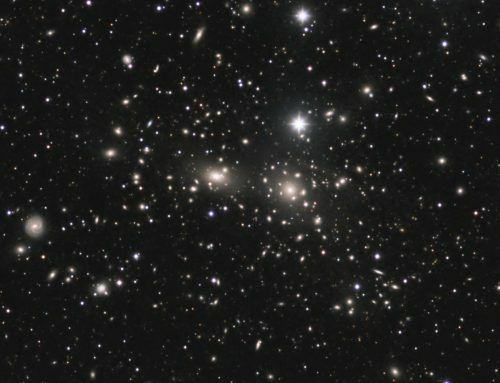 above centre left, and centre right) or fuzzy patches that don’t look like the other stars. I made an annotated image that shows some of them. Sky-Watcher Esprit 150 f/7 refractor, QHY 16200-A camera, Optolong Ha, L, R, G and B filters, Paramount MX. Acquisition with TheSkyX unguided. Focused manually using a Bahtinov mask. Automation with CCDCommander. All pre-processing and processing in PixInsight. Acquired from my SkyShed in Guelph. No Moon, average to above average transparency and average seeing. Data acquired March 7-8, 2019. The BatchPreProcessing script was used to perform calibration, cosmetic correction and registration of all frames. ImageIntegration was used to make the L, R, G and B masters. DynamicCrop was used to crop all the masters identically. DynamicBackgroundExtraction was applied to each master twice, with Division followed by Subtraction. Creation and cleanup: The R, G and B were combined to make an RGB image which was colour balanced with PhotometricColorCalibration. Deconvolution: A star mask was made to use as a Local Deringing Support image. A copy of the L image was stretched to use as a range mask. Deconvolution was applied (80 iterations, regularized Richardson-Lucy, external PSF made using PSFImage script with about 30 stars). LRGB Combination: The L was applied to the RGB image using LRGBCombine with default settings. 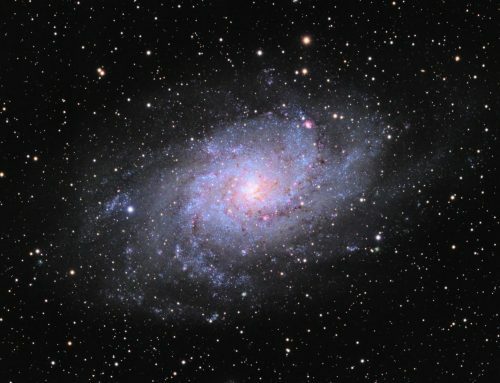 Nonlinear Noise Reduction: TGVDenoise was used in L*a*b* mode to reduce noise with a mask used to mainly target the background areas and protect the stars(max. 1000 iterations and convergence selected for both luminance and chrominance). 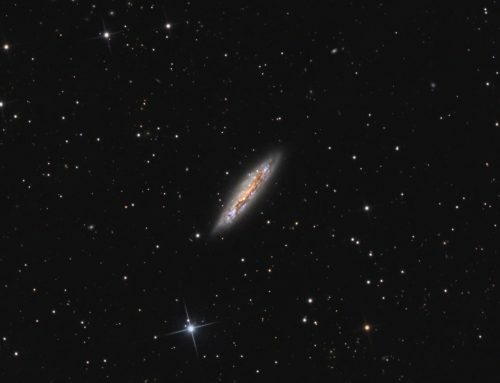 Dynamic Range Compression: HDRMultiscaleTransform was applied with 6 layers using a mask to target just the Whale Galaxy. Using the same mask, LocalHistogramEqualization was then applied twice. first with a scale of 30 (max contrast 1.5, strength 0.52, 1 iteration), followed by a scale of 120 (max contrast 1.5, strength 0.22, 1 iteration). Sharpening: MultiscaleLinearTransform was used to sharpen Layers 2 and 3 with strengths of 0.1 for both. A mask was used to limit sharpening to high-signal areas and to protect the stars and background regions.